Jennifer Samuels took a heightened interest in state politics last year when her representative, House Majority Leader John Allen, said teachers were taking second jobs so they could buy boats. Now, the eighth grade English teacher wants to teach him a lesson. Samuels, a Democrat, plans to run against Allen in the House in Legislative District 15 this fall. The Desert Shadows Middle School teacher is one of the public education advocates who, fired up by Arizona’s “Red for Ed” movement, plans to channel her energy into political activism. Inspired by the recent teachers’ strike, parents and educators across the state are knocking on doors, volunteering for campaigns and running for elected office. They want to ensure their voices are heard in November and beyond. For Samuels, 38, Allen’s comments aren’t the main reason she jumped into the race, but they may as well be the cherry on top. She went through Emerge Arizona’s candidate training last year, and planned to run for office in 2020. The recent teacher movement bumped up her timetable. The educator and mother, who lives on the border of Scottsdale and Phoenix, is disheartened by overcrowded classrooms. Teachers are underpaid and unappreciated, and the GOP-controlled Legislature continues to put off prioritizing public education, Samuels said. “It will be my pleasure to run against someone as tone-deaf as he,” she said. 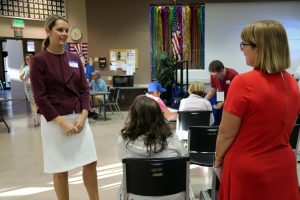 This week, Samuels and Kristin Dybvig-Pawelko, who plans to challenge Rep. Heather Carter in her bid for the LD15 Senate seat, gathered signatures during an LD15 Democrats meeting at the Paradise Valley Community Center. While Dybvig-Pawelko acknowledged that Carter has championed education issues during her time at the Legislature, she said the district needs someone who is willing to cross party lines and isn’t afraid to go against party leadership. Carter, however, is one of the more moderate Republicans in the House and has been known to go against the majority of the GOP caucus in the past, supporting the 2013 Medicaid expansion. “She’s been there a long time. And I do respect her, she’s a great candidate, but it’s time for a change,” Dybvig-Pawelko said. The Arizona State University professor and mother of three said she has seen firsthand what budget cuts have done to the university system. While universities can raise money through fundraisers and donations, local school districts often don’t have the same reach. But even if they did, she said, they shouldn’t have to resort to that. Dybvig-Pawelko said she was incensed by the refusal of Republicans to meet the education advocates’ full list of demands, such as adequate pay for support staff, capped class sizes, and a maximum 250 student-to-counselor ratio – requests she said were reasonable. But what really pushed her to run for office was that there weren’t any Democrats vying for the seat. Running for office was something she planned to do eventually, but last week’s demonstrations prompted her to “hit fast forward,” she said. Allen and Carter did not return requests for comment. Democratic teachers aren’t the only ones gearing up to run for office. Republican Bonnie Hickman, a teacher in the Gilbert Unified School District, announced plans on May 1 to run in the GOP primary against Majority Whip Kelly Townsend, R-Mesa, or seek the seat to be vacated by Rep. Doug Coleman, R-Apache Junction. Inspired by the “Red for Ed” movement, she announced her plans to run in Legislative District 16 on Facebook. Townsend said several people have taken out candidate paperwork to challenge her in the Republican primary. A vocal opponent of the “Red for Ed” strike, Townsend consulted with lawyers about the possibility of a class-action lawsuit on behalf of those affected by the walkout. “That angered a lot of people and they obviously don’t want me to continue to be in the House because I’ve become a threat,” she said. Republicans shouldn’t take anything for granted this upcoming election, Townsend said. But she said she’s confidant in her race, and received nothing but positive responses from her constituents. Instead of focusing on her own election right now, Townsend said she’s trying to recruit people to run for school governing boards. West Valley resident Melissa Zuidema has her own plans to run for school board. Disappointed that members of the Litchfield Elementary School District governing board weren’t more supportive of teachers during the strike, Zuidema is running for one of the open board seats. A former member of the Arizona PTA Board, Zuidema has been involved with the district for roughly a decade, working as a parent leader in several district schools. She had previously toyed with the idea of running for the board but being at the Capitol during the strike gave her the nudge she needed. Those inspired by the “Red for Ed” movement aren’t just running for office. Some are working behind the scenes to help pro-education candidates and causes. Patrick Callahan is taking to the streets to collect signatures for the Invest in Education Act. The Tucson resident teamed up with other Tucsonans to collect signatures for the ballot initiative to better fund public education by boosting taxes on high-income earners. The small group has a simple strategy: Look for events in Tucson where they’re expecting long lines — concerts, comedy shows and street fairs — and approach people there. Callahan grew up in the public school system and remembers hearing from teachers about the lack of funding, even before the 2008 economic downturn. But he couldn’t sit back any longer after hearing the struggles several of his childhood friends, who are teachers, face. “Seeing that many people in the streets trying to solve a problem that I’ve been hearing about basically my entire life was a huge inspiration and it got me out of the house for the first time in a few months honestly,” he said. David Garcia and Sen. Steve Farley — Democratic candidates for governor — have benefitted from the “Red for Ed” momentum with a new flood of people signing their nominating petitions and stepping up to volunteer. Josh Rosenbaum, a reading specialist at Camelback High School, is enthusiastic about Arizona politics for the first time in a long time. He recently offered to knock on doors and do social media for Garcia’s campaign — anything he can do to help. Calling Arizona a bleak landscape for liberals, the die-hard Democrat hasn’t been politically active in years. Now Rosenbaum, 44, is doubling down and helping with Garcia’s campaign and leading petition drives for the Invest in Education Act. Tucson special education teacher Dan Habinek didn’t know much about Farley until the “Red for Ed” push swept through the Capitol. Habinek was moved by Farley’s passionate floor speeches on K-12 education, and the state senator’s willingness to meet with teachers. For Habinek, who has pledged to aid Farley’s campaign in any way he can, it comes down to a matter of trust. He compared breaking someone’s trust to crumbling a perfect piece of paper. That’s how public education has been treated in Arizona for years, he said. Even smoothing out the piece of paper won’t make it perfect again. Instead, it’s time for a fresh sheet of paper, Habinek said. “It’s like that light at the end of the tunnel – it’s lit,” he said. Posted in Accountability, Advocacy, Educators Protest, Every Student Succeeds Act, Funding For Education, No Child Left Behind Act, Pension & Salary, Students and Parents Protest and tagged "Standing Strong for Public Education", #iBelieve, Accountability, Accountability System, Advocacy, Department of Education, Diversity, Education, Equity, Every Student Succeeds Act (ESSA), Failing Schools, Federal Education Policy, High-Needs Students, NEAExecutiveCommittee, Pensions, Public Education, School Choice, Testing and Accountability. Bookmark the permalink.